Schedule willing, we plan to offer this webinar on a regular weekly basis, so you’ll be able to use that same URL to register for each weekly event. These may be not the same day every week but certainly we are aiming to run it regularly. So what’s the “Ask Us” webinar all about? Well, it’s designed to allow you to ask any question you want about the cloud, business or technical it doesn’t matter. I am also happy to take questions in regards to SharePoint as well. There is no set agenda, just turn up at any time during the webinar and ask any question you want and we’ll do our best to answer it. If we can’t answer it during the webinar we’ll aim to get you the answer afterwards. We can also demonstrate anything specific on the screen. Again, there is no obligation and the webinar is free for anyone to attend. We encourage you to attend to get all those burning cloud questions answered or just attend to see what others are asking. Of course if you can’t attend this session look out for upcoming webinars at the same URL. In this episode we cover off a whole raft of metrics for your IT business as well a great question about getting new clients. Remember as always, keen to hear you feedback on the above page or via an iTunes review or directly if you are shy. Stay tunes for upcoming episodes real soon. I’ve just complete a short eBook entitled “Six Strategies to Selling Office 365” and an accompanying 8 part video tutorial series for Cloud Business Blueprint members. The complete content (eBook and videos) is only available to Cloud Business Blueprint members, but if you jump on our no obligation email list by visiting Cloud Business Blueprint and sign up for the free 8 part profit training course, I’ll also send you a copy of this “Six Strategies” eBook for free. Again, no obligation to become a full member of Cloud Business Blueprint (although I’d love you to), just sign up for your free 8 part profit course and you’ll get a free copy of this eBook emailed directly to you. Easy! We all knew that SkyDrive was going to be renamed but until now we weren’t sure what that name would be. Well now we know – it will be called OneDrive! For current users of either SkyDrive or SkyDrive Pro, you’re all set. The service will continue to operate as you expect and all of your content will be available on OneDrive and OneDrive for Business respectively as the new name is rolled out across the portfolio. So SkyDrive Pro becomes OneDrive for Business which I think will reduce confusion in the market place about the product and which market it serves. So, now we just have to wait and see what other changes get rolled into this updated product. Thought I’d share with you two sound ‘suggestions’ I’ve come across recently. In my never ending search for methods to be more productive I’ve tinkered with different types of background sound to help improve my focus. The best I have found so far is Focus at Will. There are free and paid options as well a number of different sound tracks you can listen to. At the very least I urge you to give it a try and see if it does help your focus as that is what the tracks have been specifically designed for. The other thing you may not have seen with Chrome is that when a tab is playing something a little speaker icon appears on that tab as shown above. This is great when you a lot of tabs open and some annoying ad starts making noise. A quick search of the tab headings in Chrome will allow you to locate that quickly and easily so you can deal with. Love to hear what results you get with Focus at Will, because it has been very effective for me. The good guys over at Mobilezap have provided me with another Nexus 5 case to review here. This one is more your traditional cover in that it simply fits over the back of the phone. It leaves all the Nexus 5 buttons and fitting available for use directly. This means that in some areas the cover doesn’t completely cover the edges of the phone (like around where the power cable plugs in). This potentially leaves the phone un protected at that point, so if you drop it and it fall at a certain angle your phone may get damaged. What I like about this cover is that it is really thin and add little bulk to feel of the phone. I also like the material that it is made out of. The feel is much better and ‘gripper’ that other neoprene style covers. The cover is easy to pop on and off while fitting the phone like a glove. If you want something light, convenient and like a skin on your phone with a great feel then I’d recommend this cover. Thanks again to Mobilezap for the opportunity to evaluate. 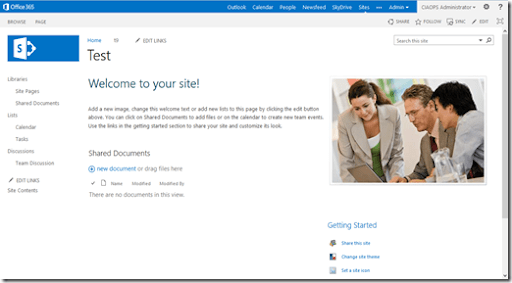 but now I have done a video on how to save and re use a SharePoint Online template. What this is letting you know is that it you have the option to upgrade the interface (i.e the look and feel) to the latest SharePoint 2013 version. 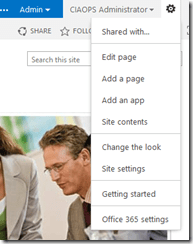 For most people who have used SharePoint this upgrade is something that you can do immediately. Where it becomes more complicated if you have gone in a done some major customizations to the look and feel (i.e. HTML and CSS changes) or inserted custom code (i.e. solutions and web parts). In that case, you are really need going to need to spend some time testing these with the new 2013 interface. Also remember that upgrading a site collection will also upgrade all subsites automatically as well. 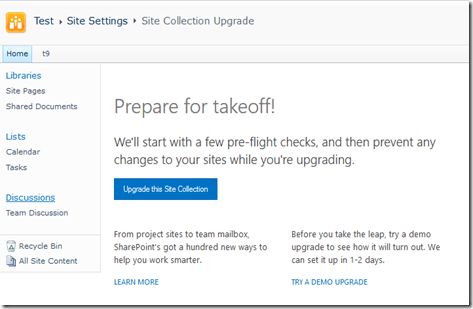 However, in this case, I know I have a very basic SharePoint site collection so I am going to proceed with the upgrade by selecting the Go to the upgrade page now link in the banner. That will take me to a page like you see above. Here I have the option to Try a demo upgrade if I want but I am happy to proceed with the complete upgrade so I select the Upgrade this Site Collection button. Importantly, taking this option means that when the process is complete I will be unable to roll back to the 2010 version of my site, so make sure you are 100% certain that is what you want to do. You’ll receive a confirmation that you want to proceed with this as it is a one way trip! I’m sure I won’t have any issues so I press the I’m ready button to proceed. Now the upgrade will be scheduled. It may take a while for the upgrade process to commence so be patient. If you get cold feet you can press the Don’t Upgrade Now button, however if just wait this page will refresh every 60 seconds or so to let know the status. Pressing the Refresh Now button doesn’t make the upgrade process commence any quicker (much like traffic lights). Shortly, the upgrade process will commence as you can see above. Again, the screen will refresh every 60 seconds or so and provided updated information on the progress of the upgrade. 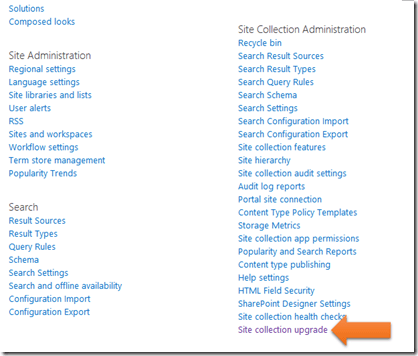 The time to complete the upgrade process will depend on the size of your SharePoint site collection and the amount of information and sub sites it contains. Which is probably only going to be of use if the upgrade failed for some reason. In most cases you’ll select the Let’s see this new site button in the lower right hand corner. 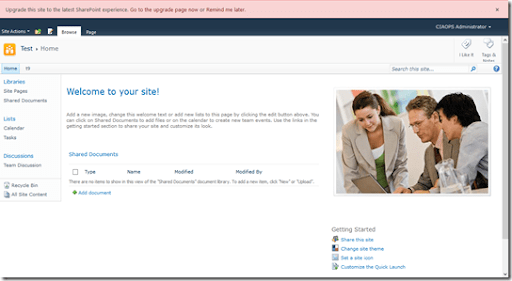 Doing so should reveal the upgrade site with an updated SharePoint 2013 interface like shown above. 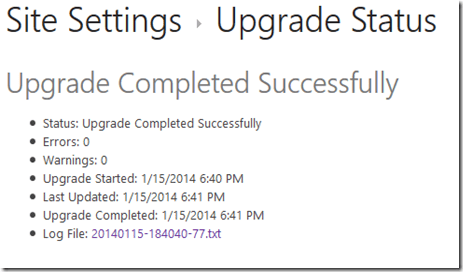 If you do need to revisit the upgrade log you can do so. Select cog in the top right hand corner and from the menu that appears select Site Settings. In the bottom right of the Site Settings screen under the Site Collection features select Site Collection Upgrade. Now select the Preview Site Collection Upgrade Status link in the middle of the page. You’ll again see the link to the upgrade log file. Now what happens if you do nothing and don’t upgrade your site collections to the 2013 interface? It is my understanding (and I am not 100% sure about this) that come April 2014 Microsoft will automatically upgrade any old Wave 14 site collections to Wave 15, but as I said I haven’t found anything definitive on whether this will be case and how it will be conducted. Best advice? Upgrade as soon as you can so you have the control.